If recent cyber attacks have you wondering if your company is next, you’re not alone. Cyber attacks are occurring at an alarming rate and those are just the ones the media is reporting on. Many companies large and small are choosing not to publicize or report these breaches to the authorities in fear of damaging their brand reputation. This is especially prevalent for companies with an e-commerce component or managing sensitive personal data. Although more vulnerable than ever, you no longer have to remain uninformed about how your network computer system supports your company. Because of modern assessment and monitoring tools, you don’t have to go back to school to obtain a degree in Information Technology to make sense of this either. Knowledge is power, and while your not going to master IT Security, finding out what’s underneath the hood could help you avert a crisis for your company before it happens. Like many medium to large sized business owners, IT services are often outsourced to a managed services providers and/or addressed by a dedicated professional at your company. That said, when was the last time you didn’t sign off sign on an IT recommendation without knowing what you were agreeing to? Now with the help of Derive Technologies, an operating partner of Integrated Security, there are no more excuses for feeling “IT insecure.” Illuminate weakness in your network and prevent a security breach or worse. While this may sound like a daunting and costly task, it’s not. Derive’s automated scanning solution can provide a broad and efficient method to detect a wide range of known vulnerabilities, configuration weaknesses, and similar low hanging fruit for exploitation. Routine testing over time demonstrates disciplined corporate compliance and can quickly identify any regressions or newly introduced issues. 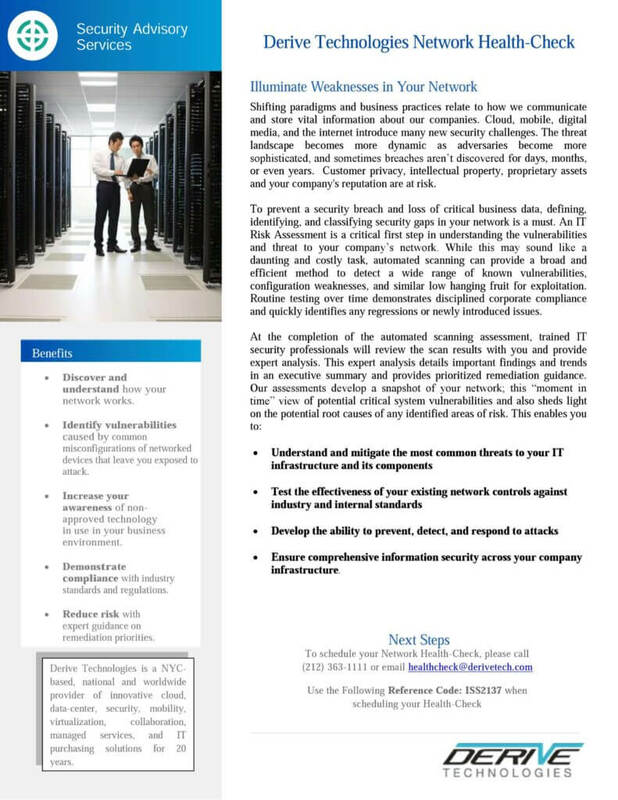 Let Integrated set up a Network Health Check for your company. To schedule your Network Health Checkcontact us today. We recommend you include a member of your company’s IT support team to assist with detailed information about your network. For prompt service, when contacting Derive to set up your Network Health Check be sure to provide them with reference code# ISS2137.